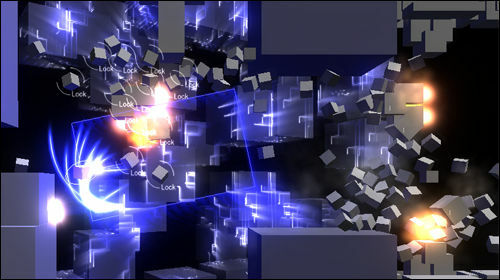 Exception is a 3D scrolling shooter which mainly features enemies made out of grey blocks, and though that may sound unimpressive it does allow the developer to place nearly two thousand objects on screen at any time. Use the cursor keys to move, and press either the A or S key to rotate. Hold the Z key to shoot, and press the X key to activate your missile lock. You can use the C key to push blocks away, but only if the second gauge at the bottom left of the screen has at least one charge.